Transnomis Responder511 is changing the way situational information is communicated. Most recent issues can be highlighted, to ensure they are not missed. Responder511 is a common operating picture like no other. It focuses on mapping road obstructions for emergency responders. Why is this so important? We do more of what we do every day during major incidents. If we replace email, fax, and voice communicated road information used in every response call, we solve the major communications problem with road information, and by extension we solve the major communications problem during major incidents. Responder511 is a regional, all-stakeholder, common operating picture. It features aggregated map layers for road obstructions, emergency access points, persistent hazards, resource locations, permitted burning, and other situational information. Push notification includes a map of the location, and links to the common operating picture. Agencies can personalize the service by adding custom private map layers. Most clients acquire their road information from Transnomis Municipal511, with the support of their public works departments. Shared situational awareness within and across regions during major incidents and planned events. 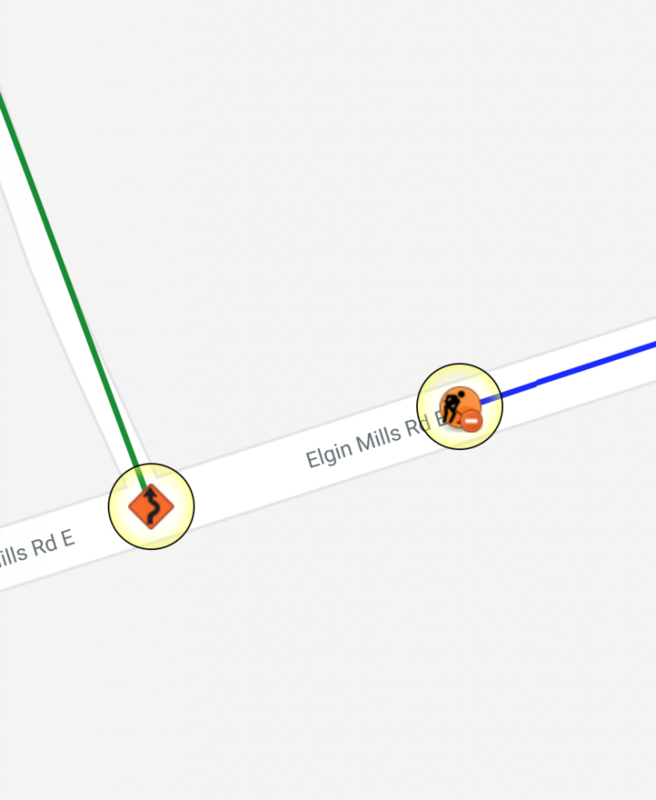 Road issues are presented on the map with an icon that reflects the roadwork, incident, condition, etc. type. Clients are encouraged to add additional attributes to their road issues, which are presented as secondary icons. E.g. “Road Closed – No Emergency Access” will display a red road closure sub-icon. Road issues posted for the future include a sub-icon that indicates it is in the future. Future issues, with an indicator, can be turned on and off. Road issues can be posted with multiple road segments. Detour routes may be added to an issue, and will be displayed with a detour icon. Unmaintained winter roads can be posted for multiple roads as one issue, months in advance. Road segments display as lines, and Responder511 features a follow the road mapping feature. Simply click at the start and end of a road segment, and the line will be created along the road. Additionally, Responder511 will automatically describe the location or segment. E.g. “White Lake Road 22m Northeast of Green Meadow Road”. Polyline and polygons are also supported. Many of the data layers are supported with the Emergency Management Symbology (EMSymbology) that was developed with funding from the Natural Resources Canada GeoConnections Program. Responder511 is priced to municipalities by population. If a county or regional government purchases Responder511, the lower-tier and single tiers serving the same population may use the service without additional fee. When purchased as a Municipal511 add-on, the price drops significantly. This unique pricing model aligns with Transnomis mission to map all road obstructions for emergency responders, and public works who also need to know what is going on within and around their municipality. Common operating picture for road issues, incidents and planned events. Hosted web service that works in all modern internet enabled devices, without installing, managing or maintaining software. Available as a Municipal511 add-on or standalone service. Email notification to distribution lists, with fax and SMS options. Can be integrated with public safety applications, including GIS, dispatch, AVL, etc. Add-ons include private map layers, that can be shared selectively. Priced per population to municipal governments; and when purchased by upper tier, lower and single tier municipalities serving the same population are eligible for service as well. Business Manager previously led the development of interoperable national and provincial public safety situational awareness systems and protocols. Private mapped data layer, that can be shared selectively. Fax and SMS push notification options.